jfrankamp was awarded the Basic Barnstar by warren for their work in this research note. I wanted to build out an air remediation plant for my home by following the activity instructions pretty closely for my first attempt. 1 Hose & Diffuser $4-6? This build was more expensive than it had to be. I think I overspent on the plant and alternatively I could have gone with a smaller one or been really patient and used cuttings. The pot was an aesthetic choice, but plastic still. I could have shaved a bit off there. The growstone was more intentionally overbought because I wanted to use it again. I didn't use very much of it for this build. The carbon was about half used. Here you can see the hose interface I chose. 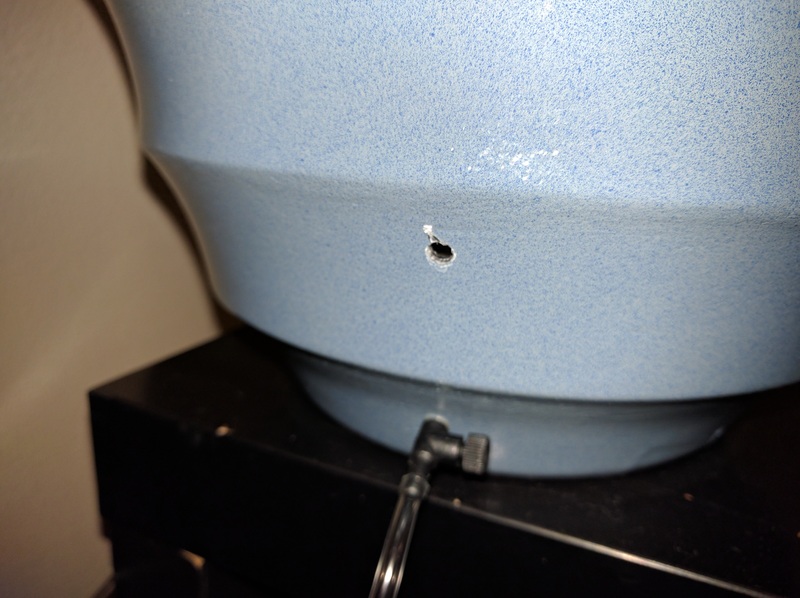 I put the valve near the base and epoxied into a hole I drilled into the pot. I felt like that might be more reliable than trying to seal a flexible hose. The epoxy was probably not an ideal plastic bond. 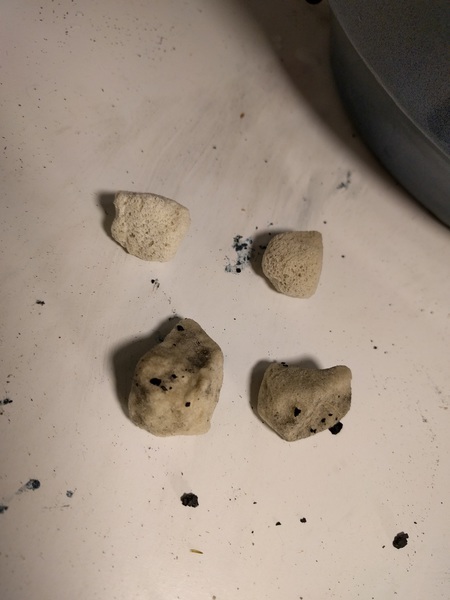 I presoaked the growstone and carbon. They were difficult to mix because of the porisity of the growstone, and density of the carbon. I was worried the carbon would all go to the bottom, so as I scooped the stone in I alternated to try to get a good mixture. 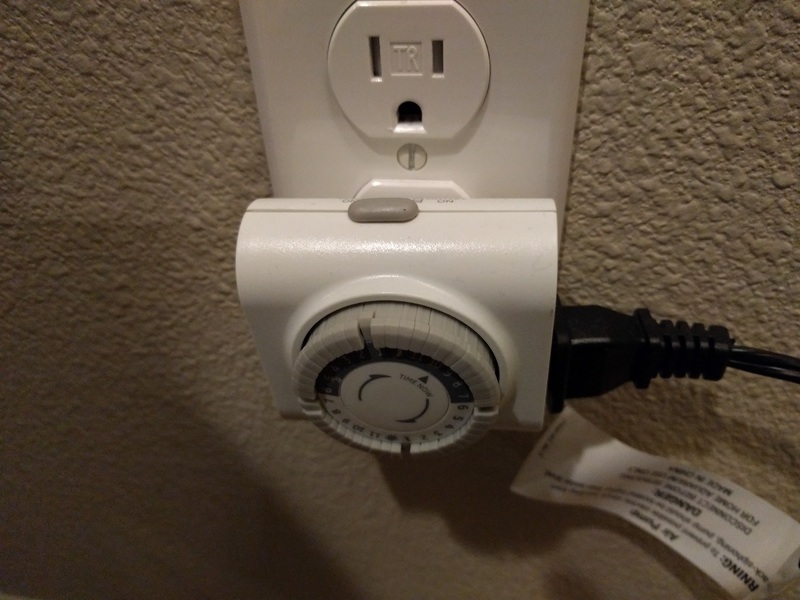 I used a timer to adjust the air, I wanted to be able to give it a few weeks with only half hour, and then stagger the increase in airflow. 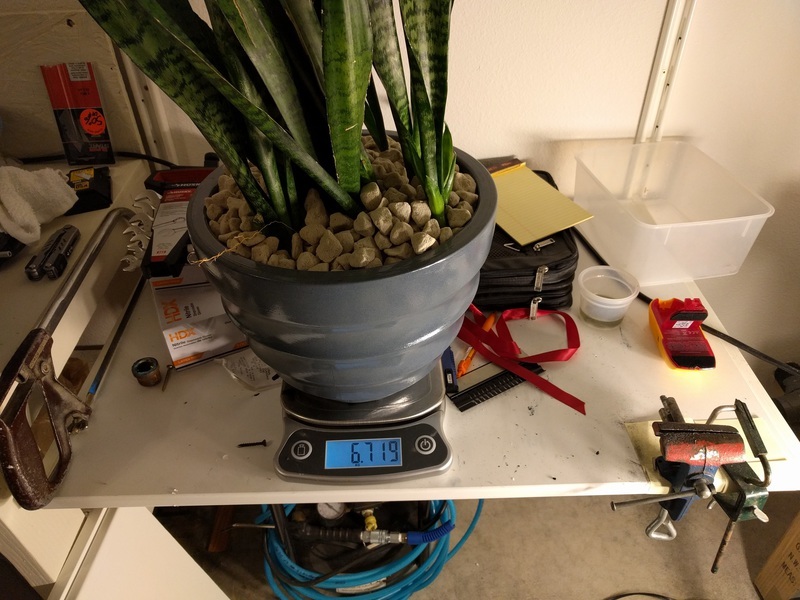 I decided to tear the plant all the way down to be able to look for root growth and weigh different parts of the planter (carbon vs growstone vs plant vs unabsorbed water). For airflow it has been 1 week of no airflow, then 3 weeks w/ 1 period (24h apart), and finally 3 weeks w/ 2 periods (12h apart). A period on the timer is 30 minutes. I wanted to also see if I had killed the plant and it was just lying to me by being so pretty on top. 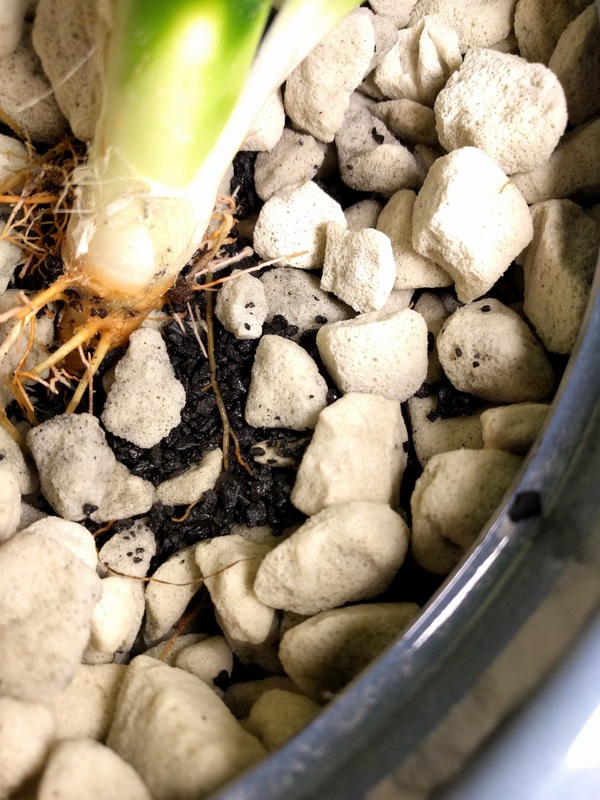 Here is the difference between a two growstones in close proximity to the root (pictured at bottom) and on top of the planter (top). The stones near the roots and carbon were quite moist, even though it was well above the waterline defined by the hole in the bucket. The carbon didn't all wash down even through weeks of intermittent watering. Also I saw what I was hoping to see: root growth right through one of the carbon veins. After I saw that I lost the heart to tear it all the way down to get the component weights and see how much carbon sits at the bottom in the water. I saw a lot of active root growth and shoots coming up too, so I think maybe the plant will make it. 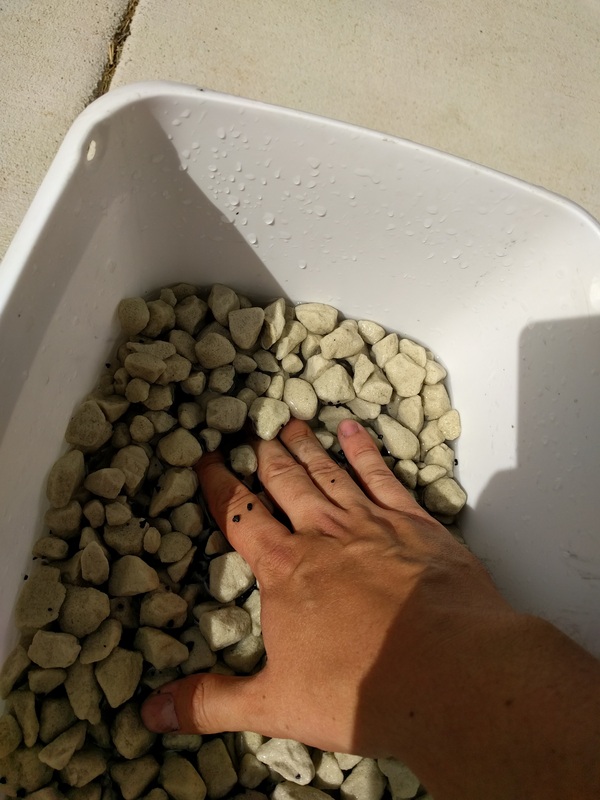 What if we used a flour or starch based glue to attach carbon nodules directly to roots? Would that VOC sink being so close be beneficial to the plant & bacterial colonies? How much is moving air through activated carbon cheating re: formaldehyde remediation? AKA how can we know how effective the plant is if the activated carbon is so effective at removing VOC's in the short term? I believe the plant is ultimately involved, but after reading through all the peer reviewed articles I can find, I don't see any direct test of plant-managed bacteria colonies removing stored VOC's from activated carbon. The closest test involved plants that were tested over a 6 month period and got better (presumably more and more specialized bacteria) at eating formaldehyde. I'd like to try to come up with a test for this. I'm working on an experiment design with my brother who is a chemist familiar with VOC test techniques. Try to miniaturize some of the parts, re: replacing the pump with a 5v fan that can be run w/ all of those USB dc converters for old cell phones we all have lying around. 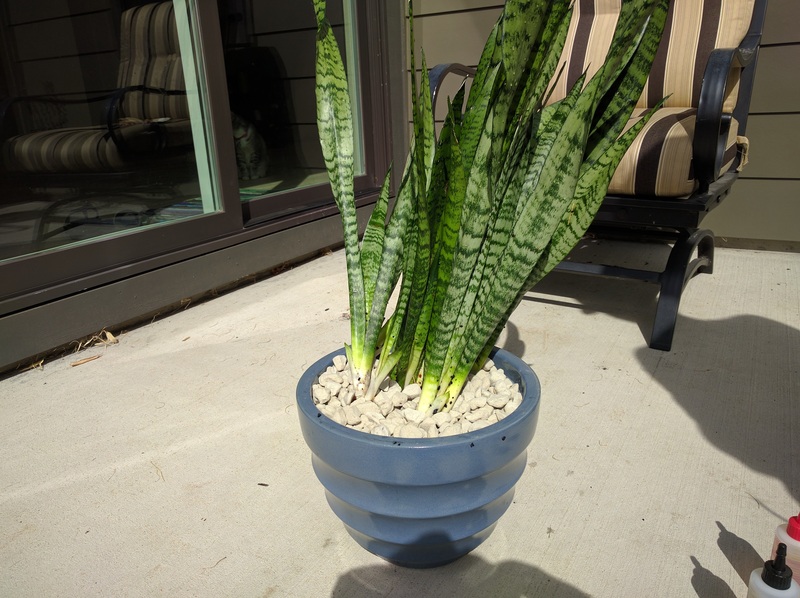 Try a couple of different plants (small bella palm and small spider plant are next). Try to propose a combination of the first two bullets for a kickstarter perhaps. I like clean air. I have a bathroom with some exposed particle board. I think it stinks. I'd like to see people live with more plants. One of the things the author of the original studies funded by NASA found was that homes with plants had higher humidity, which is normally associated with mold growth but tropical plants give off anti mold VOCs of their own as a defense mechanism. These kind of home human-plant symbiosis findings amaze me. Its great that your thumb was greener than expected and that the water roots were forming and growing through carbon deposits. Your question about apportionment of air purifying capacity i.e. how much is the bacteria in the roots metabolizing vs how much is the carbon filtering is a great one--especially for the reasons you mentioned: metabolism can increase with time while carbon sequestration will decrease with time. I genuinely have no idea what the answer would be and am pretty excited about what you're cooking up. Maybe at some point we should pool our peer review articles and make a phyto-bio remediation library wiki page, so everyone can see what we're reading? @gretchengehrke has done lab work on remediation and might be better able to imagine whether sequestered VOCs in carbon could be degraded by bacteria and help the plant/bacteria symbiosis. I actually hadn't thought about how mixing the growstone and carbon is actually a potentially inefficient and wasteful use of the carbon that sits below the suction hose. Scattering the carbon on top might not be a good use, if as Josh wonders, the vocs could be extracted from the carbon to extend their usefulness. I like the max fill hole even if it is messy and sneaks up on ya sometimes. this is fantastic work. I'm looking forward to seeing your experimental design! we can set it as an activity for others to try out as well. @warren any chance we can develop a replication barnstar? Yes replication barnstars!! We need to refine and expand the replication features. 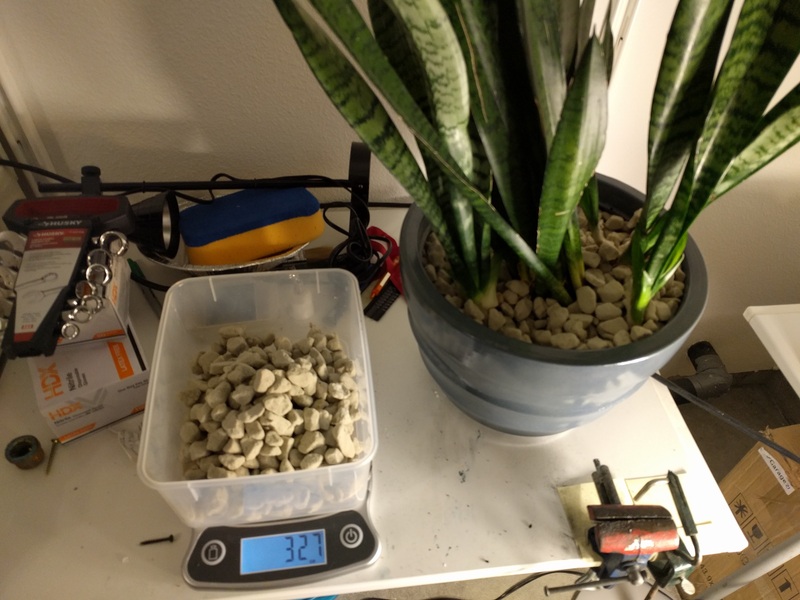 I'd like to try a couple variations like high/low airflow, comparison of plant vs just carbon, that sort of thing -- but I need to catch up on how to measure/evaluate formaldehyde to do such tests. I guess I don't have to wait until then to start making one of these, but it does seem like it'd be helpful. Also -- is there an active discussion of whether airflow could go the other way, and the pump could be unmodified? Maybe I could ask that as a question? This is so cool! I want to do mine in a glass container so I can watch some of the root growth. warren awards a barnstar to jfrankamp for their awesome contribution! @warren Thanks for the barnstar! I put an answer, but not a definitive one on the question. @nshapiro When I get the next one built I'll see if your flow meter is available, that sounds great. 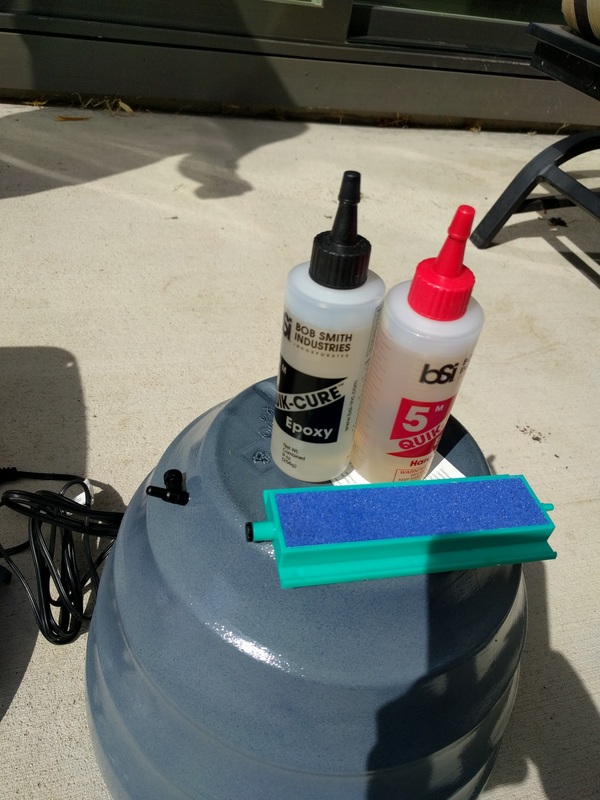 I don't intend to run the fan through a tube thats for sure, they will move air differently (making a lot of assumptions here) but the pump is a pressure device first, and a flow device second because it's built for pushing air to the pressure (& rate) required at the bottom of a tank of water. For fan I expect I might have to make a manifold if I can't get it into a good position, but there is a lot of air space between the rocks. These little fans are rated at something like 5-7 CFM, although a heat sync is easier to push air through than rocks :-) We'll see! I might also need to put something like an equivalent fiber filter in just to keep it somewhat equivalent. how much do you think building 10 of these at a time would cost? Where might there be savings? Hi, Nick - i had a bunch of ideas building on the remediation kit that I'm hoping to post sketches and notes on today. Eager to hear your thoughts! Absolutely! I just heard back from the UCSD guys and they spent about $200 on 10 kits including plants. Looking forward to seeing your sketches and notes @warren! (I'll be in the air for most of tomorrow so may be some delay). I'm excited this is picking up again!